Occlusal equilibration is a term used in dentistry to describe the adjustment of the way your upper and lower teeth bite together. Altering the chewing surfaces of some or all of a person’s teeth allows the jaw joints to be in the properbanatomical location when the teeth are fitting together. The mandible or lower jaw is a “U-shaped” bone, with a joint on either end. These joints are located just in front of each ear. When the jaw system is functioning properly, the lower jaw is able to freely hinge at the joints and close together with all the lower teeth contacting all the upper teeth very evenly. This creates a “solid bite”. When there is a discrepancy between where the teeth bite together best and where the jaw joints are fully seated, joint problems can develop, tooth wear problems can develop, or some combination of both. Very often, the jaw will have to shift in order to allow the teeth to fit together completely. This shifting of the jaw creates stress: in the joints, the muscles and the teeth. When any of these signs of instability are found, we study the bite relationship by using study casts of your teeth to determine if adjustment of the biting surfaces of the teeth will correct the problem. Often, prior to proceeding, splint therapy is recommended in order to ensure proper seating of the jaw joints. Using splint therapy and equilibration, we are able to establish a harmonious and stable system, which eliminates the destructive forces previously present. 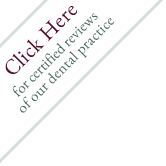 Complete occlusal equilibration is a dental procedure, which may be performed over several visits. The biting surfaces of the teeth are meticulously altered in shape to meet predetermined criteria of an ideal occlusion (bite). The object is to produce sufficient harmony between the tooth contacts, the chewing muscles and the temporo-mandibular joints (jaw joints) in order to prevent any further damage or breakdown to any of the tissues involved in the entire system. This procedure does not in any way promote tooth decay. As a general rule, the amount of tooth structure that is removed in an occlusal equilibration is very minimal (microns) and it is difficult for the patient to detect visually any changes in the teeth. In fact, prior to any treatment, it will be determined on the study casts if the goal can be achieved without removing an excessive amount of tooth structure. Patients who have received occlusal treatment often make remarks that they notice that their teeth hit more evenly and their bite feels more solid than it ever did before.